amazing coloration and a powerful high and is popular in the Pacific Northwest and Canada. but even at its peak, it's not too overwhelming. Pink Kush X Rockstar Kush - 5ml (Indica) 5ml dispenser 3840mg THC (85% Indica) This high-end RSO has been independently tested at MB labs to contain over 81.4% cannabinoids, including 76.8% THC! 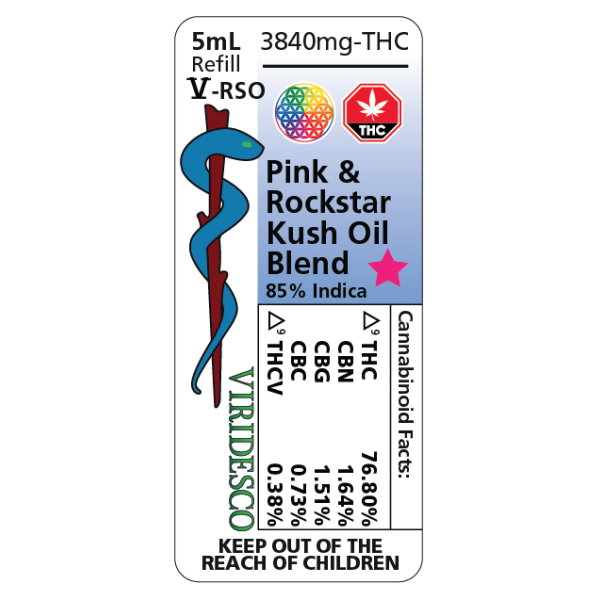 Rank Canabinols %Value 1 Delta-9 THC 76.80 4 CannaBiChromene 0.73 3 CannaBiGerol 1.51 2 CannaBiNol 1.64 5 Delta-9 THCV 0.38 This oil is made from Pink Kush and Rockstar Kush flowers grown on Vancouver Island, in beautiful British Columbia! 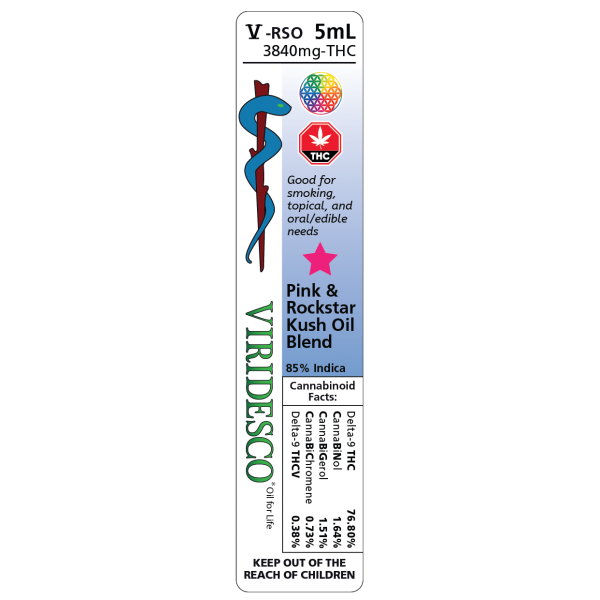 Creating super strong body effects and a sweet and delicate taste, Pink Kush is a 90% indica- dominant hybrid with a little bit of a coy attitude. No one is certain about this strain’s lineage, but it’s widely believed that she’s a descendant of OG Kush. This strain lives up to its name with amazing coloration and a powerful high and is popular in the Pacific Northwest and Canada. X Also known as Rockstar Kush, BC Rockstar is the combination of Bubba Kush and Rockstar, bringing us this super dank Indica dominant hybrid. The bold and earthy aroma is almost identical to the smooth and calming flavour. Her Indica heavy effects hit you almost immediately but even at its peak, it's not too overwhelming.